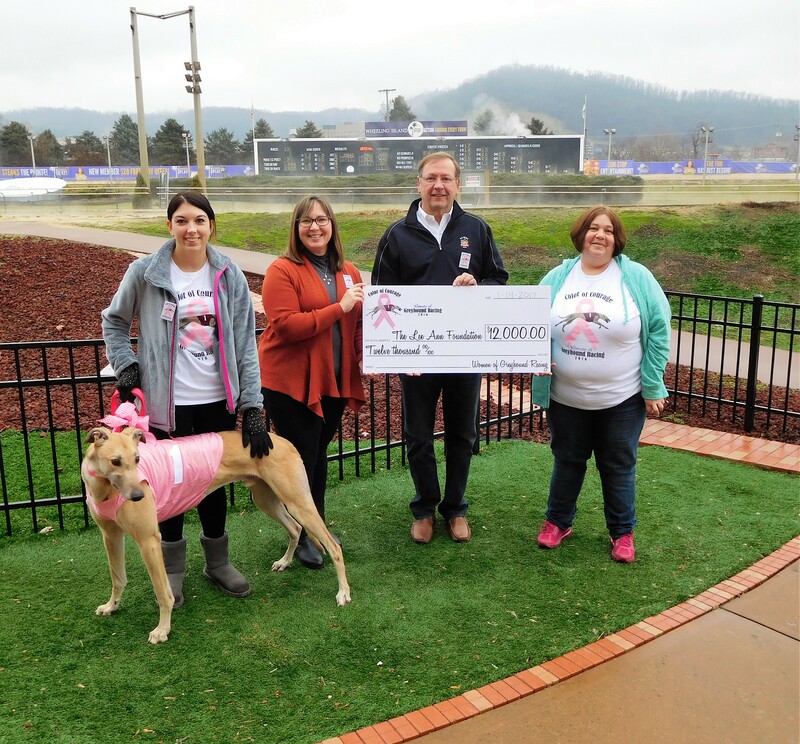 The Lee Ann Foundation, a component fund of the Community Foundation for the Ohio Valley, received a generous gift from the Women of Greyhound Racing (WoGR) in support of the ongoing fight against breast cancer. The $12,000 contribution was made possible by a variety of fundraising efforts that included a t-shirt sale and online greyhound themed auction. The Women of Greyhound Racing was established in 2013 and seeks to not only recognize women in all elements of the greyhound industry, but to also support charitable causes related to breast cancer. The timing of the project coincides with the organization’s Fall National Meet which includes elements of breast cancer awareness and recognition for both racing greyhounds and those involved in the industry. The 2016 campaign proved to be the most successful and also marked the first time proceeds were directed to a cause in West Virginia. Charities in areas with racing are selected annually to benefit from the WoGR campaign. The Lee Ann Foundation was recommended to the organization by racing personnel at Wheeling Island Hotel-Casino-Racetrack. Penny Wick, organizer of the project, was thrilled with the response. But she was not necessarily surprised since those involved in the greyhound scene regularly support relevant causes. “We had donations of all types from 23 states and two Canadian provinces. It ranged from a grandmother, whose daughter raises greyhounds, to the owner of a racetrack facility, large greyhound operations and individual greyhound adopters. The largest single contribution was $1,300 and smallest, $5, both auction items,” Wick shared. The Lee Ann Foundation was founded in 2009 after its namesake, Lee Ann Schambach, passed from inflammatory breast cancer. Lee Ann’s strength and fight inspired family members to create an opportunity to support others as they navigate similar journeys. The Schambachs knew all too well the added expense that accompanies a challenging diagnosis. Through the Lee Ann Foundation, local patients are able to receive monetary support for co-pays, wigs, travel expenses, supportive care services and other related treatment items. Brian Schambach, widow of Lee Ann, was humbled by the generosity of the group and is eager to continue supporting those fighting cancer.